The 'Thala 55' team was recently in Malaysia for a short period of 4 days to shoot some important scenes inside an aircraft and in the vicinity of the Kuala Lumpur international airport. Ajith and Anushka were involved in this schedule and the internet was buzzing with many images of the stars posing along with fans from the film's shooting spots. The film is about 30% complete now and 60 to 70 more days of shooting are left for this A.M.Ratnam production. A majority of the remaining shoots would be done in Chennai. 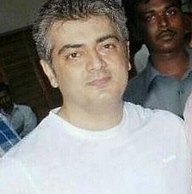 The team has already resumed shooting in the city after returning from Malaysia and recently, candid shots of Ajith were canned in the Mount Road area of Chennai at night. Trisha is also there in the film as another lead heroine, and her portions are yet to be commenced. It is to be noted that Ajith would be seen in a youthful makeover for the portions involving Trisha. Jai Says That Ajith Gave Him The Confidence To Take Up Racing. People looking for online information on A M Ratnam, Ajith, Anushka, Gautham Menon, Thala 55, Trisha will find this news story useful.